while music is played from inside. 1-Hands come up to cover his eyes. 2-He moves his hands over his mouth. 3-Smoke comes out of his ears. 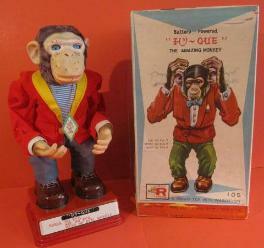 MONKEY FROM THE 1960'S, W/ THE ORIGINAL BOX AND ALL INSERT PIECES! NECKLACE ALSO REMAINS PRESENT AROUND HIS NECK.